Texture modification has become one of the most common forms of intervention for dysphagia, and is widely considered important for promoting safe and efficient swallowing. However, to date, there is no single convention with respect to the terminology used to describe levels of liquid thickening or food texture modification for clinical use. As a first step toward building a common taxonomy, a systematic review was undertaken to identify empirical evidence describing the impact of liquid consistency and food texture on swallowing behavior. A multi-engine search yielded 10,147 non-duplicate articles, which were screened for relevance. A team of ten international researchers collaborated to conduct full-text reviews for 488 of these articles, which met the study inclusion criteria. Of these, 36 articles were found to contain specific information comparing oral processing or swallowing behaviors for at least two liquid consistencies or food textures. 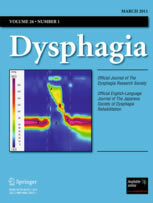 Qualitative synthesis revealed two key trends with respect to the impact of thickening liquids on swallowing: thicker liquids reduce the risk of penetration–aspiration, but also increase the risk of post-swallow residue in the pharynx. The literature was insufficient to support the delineation of specific viscosity boundaries or other quantifiable material properties related to these clinical outcomes. With respect to food texture, the literature pointed to properties of hardness, cohesiveness, and slipperiness as being relevant both for physiological behaviors and bolus flow patterns. The literature suggests a need to classify food and fluid behavior in the context of the physiological processes involved in oral transport and flow initiation. Este post foi publicado em Normal Swallowing em 24/11/2014 por Tatiana Simões Chaves. Obra de grande importancia, acredito que a deglutiçao depende da interaçao do individuo com a tarefa( atividade) e o ambiente que seriam as caracteristicas sensoriais inerentes aos alimentos. Adotando assim uma funcional.